Commonly called the sage leaved Buddleja, B. salviifolia is semi evergreen with drooping branches. 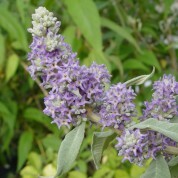 The pale lilac flowers are highly scented often considered by many to be one of the best scented Buddleja. Only moderately frost hardy this species is best grown under protection.